The Vestibulospinal tract is infact made of two tracts, the lateral and medial. 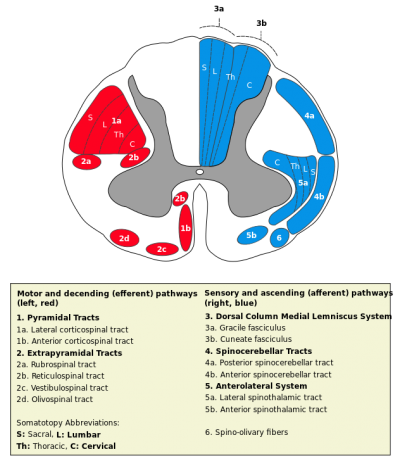 Each tract is responsible for increasing antigravity muscle tone in response to the head being tilted to one side  Fibres of the vestibulospinal tracts, the vestibular neuclei, are associated with the cerebellum, which therefore can subsequently result in the cerebellum indirectly influencing control on the spinal control  In addition these pathways recieve information from the labyrinthine system. - Fibres descend ipsilaterally though the anterior funiculus of the same side of the spinal cord, synapsing on the extensor antigravity motor neurons. - Animal studies have suggested that there is an underlying balance between descending systems controlling stretch reflex activity: the dorsal reticulospinal tract (inhibitory) and the facilitatory medial reticulospinal and vestibulospinal tract (facilitatory). If this is impaired it could cause further symptoms of the upper motor neurone syndrome. ↑ Carpenter R, Reddi B. Neurophysiology. A conceptual approach. Fifth edition. London: Hodder Arnold, 2012. ↑ 6.0 6.1 Horak FB. Postural Compensation for Vestibular Loss. Ann N Y Acad Sci 2009; 1164: 76–81.